You’re driving along a multi-lane road free and easy before for some inexplicable reason you are suddenly 20 cars deep in a line of traffic behind two cars traveling alongside each other 20km/h under the speed limit. Enraged, you stare and point helplessly at the ‘Keep Left Unless Overtaking’ signs plastered alongside the road. Surely they’ve seen them! How could they not?? Well, unfortunately for you and Australia’s most ignored road sign, things appears as though they are about to get worse. 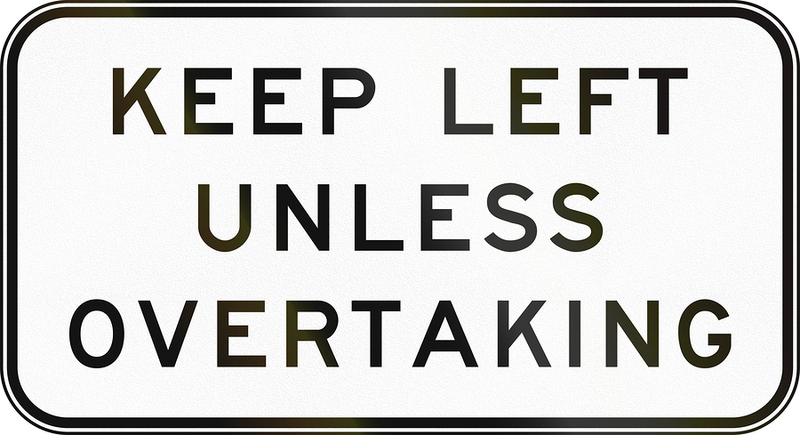 The South Australian Government has recently decided to phase out all ‘Keep Left Unless Overtaking’ signs on all multi-lane roads with speeds above 80km/h. Now before you spill your coffee or throw your smart phone to the ground in disgust, I should point out that, while it may appear to be a win for those who enjoy driving in a blocking formation with other road users, notwithstanding the removal of the signs, Regulation 130 of the Australian Road Rules states that it is an offence to fail to keep left on a multi-lane road where the speed limit is over 80km/h. Any driver who commits this offence faces a fine of up to $287.00 and receive two demerit points. Two demerit points may just be the tipping point for serious consequences including licence disqualification or heavy fines and the need for a good traffic lawyer. Given the above, our advice to road users using multi-lane roads is to keep left unless over taking. That way you avoid being fined and incurring demerit points and more importantly, the ire of your fellow road users.